“Innovation” is typically painted with broad strokes in any industry awards program. At SXSW, innovation is painted in huge, rolling strokes that cover any and everything from autonomous cars to social media apps to AR and AI to music and movie technology. What can we learn by the award winner selection? A reinforcement of some of the themes and trends at SXSW 2017 this week: Out, this year: Uber and Lyft (boycotting Austin), Obama (he made a big splash by speaking at SXSW last year–seems like ages ago), human intelligence, wearable tech (but they gave it an award anyway). In, this year: artificial intelligence (and deep machine learning), VR (hoping it’s not the new 3D? ), Biden, Fasten (bravely trying step into Uber's shoes), the Smart Cites movement. 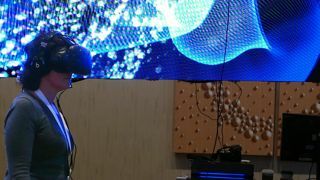 In a special VR demo/exhibit at SXSW Interactive, one of many VR demos at Sx, Spatium: a VR trilogy inspired by Philip Treacy, a direct-view LED wall surrounded the viewer wearing the VR headset. A VR “journey” ensued, inspired by a famous hat by fashion designer Treacy. A panel of judges comprised of industry peers and experts selected the winners based on four criteria: creativity, form, function and overall experience. And separately, SXSW Interactive attendees voted for the People’s Choice Award at the second annual Innovation Award Finalist Showcase on Sunday, March 12, where the 65 finalists had the opportunity to exhibit and demo their work. “The Interactive community extends our sincere congratulations to this year’s winners for this esteemed industry accolade and well-deserved recognition,” said Mason Stewart, SXSW Interactive Innovation Awards Coordinator. “Over the next few years, we look forward to seeing many more outstanding achievements from the winners of the 2017 SXSW Interactive Innovation Awards." The second annual David Carr Prize was awarded for the best essay submitted from writers, bloggers and journalists, was created last year to honor the late David Carr, a contributor to SXSW and the journalistic community. The essays follow Carr’s interest in the convergence of new media, technology, and culture. Mike Armstrong received this year’s David Carr Prize for his essay “The Heart of Something Heartless,” about morality and emotions in Artificial Intelligence. Finalist from the competition, who, overall, best exemplifies the values of innovation, inspiration and creativity. Trend that gained the most traction during SXSW Interactive 2017. Speaker from SXSW Interactive 2017 whose presentation makes the biggest impact on the digital community.